Ghanaian Rapper, Kofi Kinaata, has thrilled hundreds of traders and music lovers at the Kaneshie Market in Accra to wonderful tunes during the outdooring of Vodafone 1,2 free. 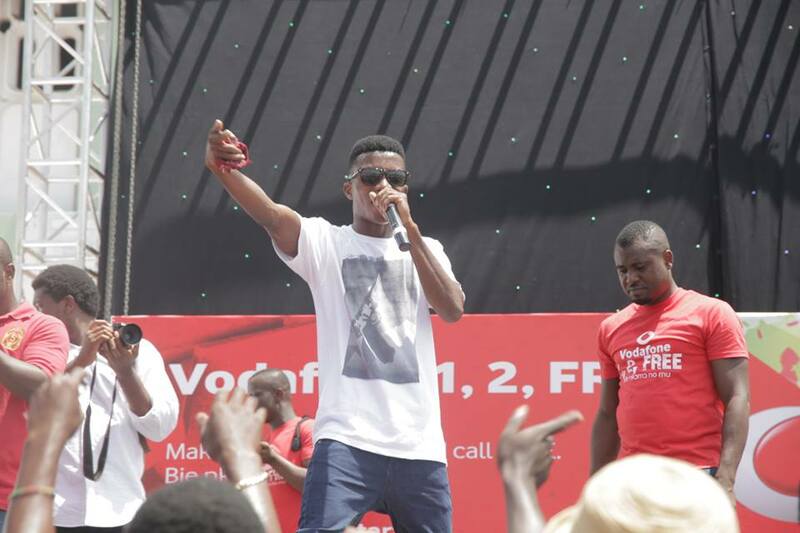 Kofi Kinaata, who is noted for his great stagecraft, took the stage to treat numerous fans to good music including some of his hit songs like ‘Susuka’, and ‘Oh Azaay’. He got the crowd going “gaga” as he performed more than 30 minutes. The ‘Fante Rap god’ sang both his old sand current hits with his ‘Sweety Pie and Action Time’ getting patrons patrons of the event on their feet to make some dancing moves. Speaking to the enthusiastic crowd, Marketing Director of Vodafone Ghana, Agnes Emefa Essah, said, “We are excited that once again we are able to deliver something unique to our customers”. She added: “Customers, are not outsiders to our business. They are in fact our targets and we will go to every length to make sure that our customers are satisfied with our services”. “Vodafone 1 – 2 – Free” gives prepaid customers free 60 minutes to call Vodafone numbers or 5 free minutes to call other networks, after every second call.